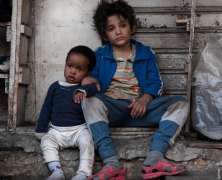 Lebanese filmmaker Nadine Labaki’s Capernaum takes us onto the gritty, lonely streets of Beirut with this moving coming-of-age story. Working with a largely non-professional cast, whose lives mirror some of the experiences shown on screen, this film is a rallying cry against social injustice. By showing us the day-to-day reality through the eyes of one little boy trying to survive amongst the hardship, Labaki has crafted a film that feels universal and urgent. "...will be counted as one of the great films about childhood." As the film opens, Zain (Zain Al Rafeea) is in the process of taking his parents to court having filed a lawsuit against them for his very existence. As the tale unfolds, we learn why this passionate and sensitive young boy feels it would be better if he had never been born. Zain may be only 12-years-old but he is world weary. With numerous children to care for, his parents have resorted to all kinds of illegal and dangerous schemes to keep the family afloat. But when his parents decide to sell his beloved 11-year-old sister's hand in marriage to a much older and suspect man, it is the final straw for young Zain. Heartbroken, he decides to run away. While living on the streets he is befriended by Rahil (Yordanos Shiferaw), an Eritrean illegal immigrant and helps her to care for the baby that she is forced to hide from her employers. But life on the streets is extremely precarious, and as time goes on it offers Zain fewer and fewer places to hide. Like Salam Bombay, Kes, or The Bicycle Thieves, this is a film which is a sobering reminder of how resilient children are, and sadly often have to be, living in difficult circumstances most of us can barely imagine. It’s been shortlisted (in what is proving to be an extremely competitive year) for the Academy Award for Best Foreign Language Film – but whether it wins or not, Capernaum will be counted as one of the great films about childhood.